Every ESP graduate leaves ESP with a successful Professional Assignment Project. These assignments consist of a thesis (literature review) that provide an answer to the research question which is ultimately implemented into an innovative product. Are you a physiotherapist and are interested in being the client for another generation of ESP students? Get inspired from past project and let us know if you want our students to create a product for you and your patients! Customized exercise protocols for many patient categories have been developed. 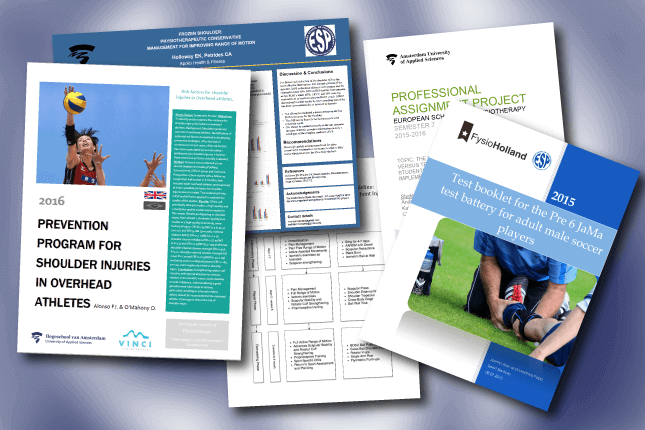 Based on the wishes of clients from Australia, Spain or Amsterdam, students have reviewed literature to find evidence for the most effective exercise for patients with ankle sprains, shoulder injuries, cancer or diabetes. To find out the most effective assessment tools and special measurement tools, students have searched through thousands of articles and created overviews of diagnostic tests for a variety of patients and screening tools for special populations such as football players upon request of one the largest physiotherapy practice in the Netherlands, FysioHolland. Not only for physiotherapy practices or patients, products are created. ESP also serves as an important client with many products that have been created especially for ESP, ESProducts. For the support of our skills courses and the development of our program, students have created beautiful online courses, website, and other teaching materials. Are you inspired to sign up as client? If you have an idea or an actual product already in mind. Please let us know and we can find students for your project! We are currently working on the sharing of the entire database of past projects, but until then, you can find some of the online products on our showcase page here.